The easiest and the fastest way to become a U.S. citizen is to marry a U.S. citizen but this applies to you if you are single. For others, the process of becoming a U.S. citizen can take longer or shorter depending on the legal status of the person. Depending on where and when you choose to file your application, the period of time between sending in the completed application and the interview to become a U.S. Citizen can vary from five months to more than two years. The swearing-in ceremony for receiving the naturalization certificate will then take place from 1 to 180 days after the interview, although in a few U.S. Citizenship and Immigration Services (USCIS, formerly known as the INS) district offices, it can take another one or two years. The length of time for the entire process depends on the number of U.S. Citizenship applications the USCIS offices receive in each state. Additionally, making a mistake on your application can cost you even more time. However, by using our unique do-it-yourself service, you will be assisted throughout the entire process - helping you prevent costly mistakes to your application. Follow These Easy Steps to Become a U.S. Citizen! We researched and consulted with immigration lawyers on how to become a U.S. Citizen in the clearest, most accurate way possible. The entire naturalization process is outlined below. 1. Submit Your Complete Application. Go to the US government's, immigration and naturalization website, which contains specific information and the exact requirements necessary for people who want to become US citizens. Immigrants who are permanent residents need to fill out the N-400 form which can be downloaded and printed directly from this website. It is necessary for a person to be a permanent resident prior to applying for citizenship. Obtain two approved passport-sized photos. Where do I get passport photos? 3. Attend USCIS Interview and Take Tests. If you qualify, prepare for the citizenship test and interview by studying basic US history and civics. You also must be able to demonstrate that you have basic proficiency in the English language. To improve your English skills and prepare for the citizenship test and interview, contact your local adult basic education or literacy program to locate an ESL (English as a Second Language) instructor or tutor. ESL classes are a wonderful resource for immigrants and those seeking citizenship, and the classes and materials are offered *free* in most communities. It's a good idea to contact your local library or community college to find out about the nearest classes or to get contact phone numbers for the classes. Taking the classes will bolster your self-confidence, make you feel connected to the community and to other people who have come to the US from other countries, and help you with the nitty gritty of learning US civics, history, and the English language. Enjoy your new life as a United States Citizen! Interviewers at the citizenship interview will ask you questions from a list of 100 U.S. history and civics questions. You will be asked to answer the questions orally or in written form. You can learn the answers to these questions at the website to reinforce what you learn in your ESL class. Be sure you memorize all the information you have given on your N-400 form. Know your permanent resident number as well as dates of departure and arrival for any trip you have taken outside the U.S. since becoming a permanent resident. Also, be able to provide the reason for the trip (business, vacation, to visit family, etc.) You can and will be asked questions taken from the information you give on your N-400 form, so be sure you know it thoroughly. It is very important to read, understand, and be able to explain in your own words the "Oath of Allegiance". You can be asked about this at your interview. An ESL instructor can and should help you with this. Be sure to practice "small talk" before you have your interview. That is, practice talking about the weather, asking how someone is doing, etc. This shows you can interact with others in basic English. Don't give up! Adjusting to life in the U.S. is filled with challenges and joys. If you reach out to others who want to help and keep taking concrete steps toward achieving your goal of becoming a citizen, you will succeed! When you become a citizen, it's a good idea to register to vote and get your passport quickly. There are three ways to become a citizen of the United States of America. The first two are automatic and occur when a person is born in the United States or is born abroad to American citizens traveling or residing abroad. For these people the simple act of being born in one of the two circumstances described above automatically makes them a citizen. There are rare exceptions to the above, the most common being children born in the U.S. to parents who are either foreign heads of state or foreign diplomats – these children are not recognized as citizens of the United States. The technical legal definitions of obtaining citizenship in one of these ways are the principle of jus soli (right of birthplace) and the principle of jus sanguinis (the right of blood). All persons born or naturalized in the United States, and subject to the jurisdiction thereof, are citizens of the United States and of the state wherein they reside. No state shall make or enforce any law which shall abridge the privileges or immunities of citizens of the United States; nor shall any state deprive any person of life, liberty, or property, without due process of law; nor deny to any person within its jurisdiction the equal protection of the laws. Guarantees citizenship under the principle of jus soli to practically every person born within the borders of the Unites States or its territories (Puerto Rico, American Samoa, etc. ), with only rare exceptions to this rule (such as children born to foreign diplomats stationed in the U.S., etc.). As to children born outside the U.S. to parents who are American citizens, there are a few more exceptions and Congress is free to redefine and change the rules for citizenship under the principle of jus sanguinis. Generally, if the mother is an American citizen, then the child is automatically an American citizen. In the cases where only the father is an American citizen there is usually no problem so long as he is the recognized biological father AND he is married to the mother at time of birth. If this is not the case then you had better get a lawyer to determine whether or not a case can be made for the child's right to U.S. citizenship. Some exceptions have been made in recent decades where the child's father is an American citizen but not married to the mother. These usually involve children born to foreign mothers who had lived with American soldiers while the soldier was stationed abroad. In these cases the affair was temporary, at least in the eyes of the soldier, and the soldier usually didn't know the woman was pregnant when he left. The Congress did pass legislation allowing some children born as a result of these affairs, especially in the case of those born to soldiers in Southeast Asia during the Vietnam War, and allowed them to come to the U.S. some twenty years or more after the war. The third way is not automatic and that applies to people who were neither born in the U.S. nor born to parents who were U.S. citizens at the time of their birth. These are people from other nations and they have to acquire citizenship through the naturalization process. The first step is to gain admittance to the U.S. as a resident alien (a person who is allowed to live and work in the U.S. but who is not a citizen). There are a number of ways to legally gain admittance to live, work, go to school, etc. Some of these ways, such as student visas or certain work visas do not allow you to apply for citizenship. Other types of legal entry visas give one the option of choosing to remain in the United States as a legal permanent resident or to apply for United States citizenship. 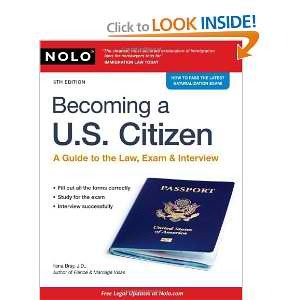 Buy one of these books that will provide detailed information and tips on how to become a U.S. citizen the easy way. It will be a good investment for you. Buy now until stocks are available. Apply at a U.S. Embassy or Consulate in your home country for an immigrant visa. This can involve a very long wait before you receive the visa and are allowed to move to the United States. Enter the United States as a political refugee and apply for asylum in the U.S. I believe that you can also apply for this from abroad as well. The requirement here is that you face persecution or even death in your homeland because of your political views. Granting of such visas is usually a political decision by the U.S. State Department. Marrying an American citizen abroad and applying to enter the U.S. with your spouse. This is a K-3 Nonimmigrant Visa for a Spouse. Check the U.S. State Department Visa page for information on this type of visa. Coming to the U.S. to the U.S. to marry your American fiancée. This is known as a K-1 Fiancée Visa (there is also a K-2 Visa issued to children of the foreign fiancée - it appears that the child in this case has to be under 21 years of age in order to be admitted on the K-2 visa with the parent). Being adopted as a child by an American citizen. This is not really an option as those adopted are generally too young to make a choice and the decision to adopt and bring the child to the U.S. is made by the American parent to be. Entering the United States under sponsorship of a relative who is an American citizen. If you have relatives in the United States you can often expedite the process by having them sponsor you as an immigrant. I believe that the sponsoring relative has to assume financial responsibility for you for up to a decade if you cannot find work. Enlisting and serving in the U.S. Armed Forces. The United States does accept foreign nationals into the enlisted ranks of the military (I believe that officers have to be U.S. citizens). This can be a route to U.S. residence and citizenship if you qualify. There are other legal avenues to enter the U.S. to become a legal permanent resident or citizen but the ones above are the most common. Gaining one of the classes of visas allowing entry for the purpose of remaining in the U.S. is just the first step. In most cases such visas expire within a short time and certain steps must be taken before the expiration of the visa in order to obtain temporary residence status. The requirements for temporary residence status vary depending upon the type of visa but usually require the filing of an application and other documents along with an interview with an officer of the U.S. Citizenship and Immigration Services (USCIS). Once temporary residence is obtained, the person is usually allowed to work and exercise all of the rights of an American citizen except for things like voting, holding certain public offices, etc. Temporary residence status is just that, temporary. Again, depending upon the type of visa you entered the U.S. under; there will be certain processes you will have to follow in order to obtain permanent residence status. A big exception involves minor children who are adopted by U.S. citizens. In most cases, these children are brought in to the U.S. and their adoptive parents can immediately file for citizenship. For all others, an application has to be made for permanent residence status. Like the application for temporary residence status, this also requires the filing of an application and documents and an interview with an officer of the USCIS. Once permanent residence is obtained the holder can either elect to live here as a legal resident alien or apply for citizenship. As a permanent resident alien, they will have to periodically renew their status but, other than not being able to vote or hold most public offices, life will be no different than that of a citizen. However, if they commit a crime such people can be deported and, there is always the possibility that Congress will change the law in the future and not allow them to renew their permanent resident alien status thereby forcing them to leave the country. 2 – they must demonstrate the ability to read, write and speak English. 4 – they must have a knowledge and understanding of U.S. history and government. 6 – they must be of good moral character. 7 - they must have a favorable disposition toward the United States. Good moral character, attachment to the Constitution and favorable disposition toward the United States is required for all persons seeking naturalization. Some of the other requirements may be waived for certain people including members of the U.S. military (citizenship is not a requirement for enlisting in the U.S. Armed Forces), spouses of American citizens and certain others. These are the general rules that most people have to follow. There are also other rules which vary according to the type of visa under which the applicant entered the U.S. and other factors. The USCIS web site contains most, if not all, of the information and forms needed for most people to complete the process. However, immigration law and regulations are extensive and complicated as well as constantly changing so it is important to follow the rules that apply to your particular situation. Lawyers can be hired to assist you with this but they are not required. The passing of a test on U.S. history and government (given in English) is one of the final requirements for most applicants. Once all of the steps have been completed, the applicant is given an appointment for a swearing in ceremony during which they take an oath of allegiance to the U.S. and renounce all previous citizenship rights in other nations and they become citizens with all of the rights, privileges and responsibilities of U.S. citizens. The only right they do not have is the right to be elected President, which the Constitution specifically reserves to those who are citizens by birth (by default, they also cannot be elected Vice President since they could not assume the office of President in the event of the President's death or removal). Good luck on your way of becoming a U.S. citizen!